Make these yummy muffins for breakfast or for a weekend brunch. Chopped nuts can be added to the batter, if desired. Preheat oven to 375°F (190°C). Grease 12 large muffin cups. In large bowl combine flour, sugar, baking powder, baking soda and salt. Stir in chocolate chips. In small bowl, blend bananas, melted margarine, milk, eggs and vanilla. Add to flour mixture, stirring only until just blended (do not over mix). Fill muffin cups. Bake for 18 to 22 minutes, or until golden brown and toothpick inserted into center comes out clean. Let stand several minutes before transferring to wire rack to cool. Tip: Use a spring-release ice cream scoop to spoon batter into muffin cups. This is the best i've ever tasted! I'm so proud of it that I put my name on it! and I made it myself. Very good muffins! They domed nicely and had a very light fluffy crumb. Excellent for breakfast, right out of the oven! these are my absolute favorite muffins! my family loves it when I make them. these are even better than my grandmother's, and anything of hers is hard to top. Yummy! Fluffy, tasty and not overly buttery or oily. This is one of the best banana muffin recipes I have ever found, comes out perfect every time and great for kids lunches and morning tea. Have had rave reviews on these. WOW, easy, tasty..will make again! Great, my family loved it! BEST EVER is right! I never bother with these reviews but had to this time! Honestly, the best muffin I have ever tasted!!! Sorry Grandma. Delicious and very moist. You'll want to keep this recipe and make it again. Best recipe EVA!! I like this recipe if I am broke but need a "munchie" for the kids' lunch or a treat for the kids after school. Much healthier then snackin on a chocolate bar!!! So good, everyone at my house said "You are the best bakstress ever". I smiled and thought in my head, It was just the recipe. Super easy to make and they turn out amazing! I've made this recipe a couple times now, and it is my favourite chocolate chip banana recipe. They taste delicious and always come out moist. Hi, Do you think it will work if i use buttermilk instead of milk? Thank you! These muffins are outstanding...were easy to make, rose beautifully, and tasted AWEsome!! AWESOME MUFFINS! So delicate and easy to make. Very light and fluffy like how a muffin should be. All my family enjoyed it. Fantastic muffins, good enough to send to my out-of-town boyfriend! I recommend baking them a bit past done, so they hold their shape. The texture is great. Yummy! YUM!! the whole family loves these!! Amazing muffins! This recipe is a keeper! These were the absolute worst muffins..the butter was soaked through the muffins cups, they were still soggy on the inside even though the outsides were brown...do not make. I followed the directions EXACTLY.. very disappointed. This is the best ever banana chocolate chip muffin. They are soft, moist and delicious. I've been making this many times already, never will change to other recipe. A big hit in my house. Thank you. Very yummy! I used mini chocolate chips and thought it was an easier eat for my little ones rather than the large chunks of chocolate. Just a thought. Thanks for the wonderful recipe. I will agree that they are extremely light and well worth switching recipes! My family gobbled these up...the entire batch was gone in 3 days. The only changes I made were: 1/2 whole wheat/1/2 white flour and I also added abt. 1/4 c. ground flaxseed. Thank you for this recipe! I used mini chips and baked them in non mini muffins pans and the were awesome. The ones I made with regular chocolate chips in cupcake liners tasted very good but stuck to the papers. DELICIOUS!!! I just made them using a gluten free all purpose flour instead and they turned out perfectly! My sister tried one and she said that the texture was even better than any other muffin and it tasted really really good. :) I'm very happy with this recipe! I never ever do reviews, but these muffins are beautiful!!! They look like Tim Hortons' and I'm so excited to try them! Best muffins ever! My family loved them! Best banana chocolate chip muffins ever! I made them this weekend and everyone loved them. Great with glass of cold milk or a cup of coffee. Nice! I'm not even a baker (very far from it) but I pulled it off! Thanks! It came out risen and soft. The only thing it lacked was sweetness. Next time I'd add maybe 1//2 cup granulated sugar. I didn't like these very much. (they were pretty bland, not enough sugar). I wouldn't make them again. Amazing, I couldn't stop eating them! These muffins are delicious! I would recommend them with some nice warm coffee in the morning. What a treat! These muffins were very good, before baking them i read a comment about the butter sinking to the bottom, and that turned out to be true, however i did use butter instead of the recomended margine. Also i would use less of the baking soda and powder just because they kind of have a salty after taste. Wow! Just found this and I will never use another recipe! these cupcakes were insane. i loved them so much that i had to make more. Hi, I am a beginner, can u please tell me why my chocolate chips sink to the bottom of the muffins. This is the best recipe I've tried yet, and it is a total keeper, muffins turned out even better than I'd hoped, delicious and fluffy, I will definately be bookmarking your site as my new go-to, Thank you Diana!! This has been the best recipe I've used to make banana muffins. They were great! My co workers ate them up in literally minutes!! I'm so happy I found your recipe. Thanks!! Just made a batch. Absolutely the BEST RECIPE ever. Moist, perfectly soft but not to the point of falling apart. This is the only recipe I will use from now on. Thanks for sharing. These turned out fabulously and domed very nicely unlike one of the other reviews I read. (will not dome nicely if over stirred). My son could not wait to try them and ate one soon as it was out of the oven. My son says a definite make again. Yup by far the best looking and tasting muffins! I will be adding this to my book of recipes for sure! This is my first time making Banana Chocolate Chip Walnut Muffins...Amazing!!!! My hubby and kids loved it!!! Thank you Diana...your reipe is Awesome!!! I made these last night and was incredibly impressed. I halved the recipe and it still tasted great :) Even the ones I made without chocolate chips were just the right sweetness. Thank you! So good! I actually accidentally left the eggs out (whoops) and they still turned out deliciously. I'm excited to see how much better they can taste when done properly! Tried this recipe yesterday, it was great. Muffin was soft, moist and fluffy. Just made these muffins! They are an easy recipe, easy to make kinda muffin! and they taste amazing!!! Strongly suggest this recipe! 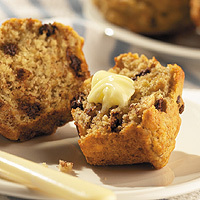 I substituted the milk for yogurt, makes them a bit more moist, very good, healthier muffin. My whole family loves these muffins. You can double the recipe without compromising on flavour or texture! Halfed the recipe and replaced chocolate chips with raisins and dried cranberry, delicious, light and fluffy! My very first muffin, very nice and successful! I've tried all sorts of banana chocolate chip muffin recipes and these are by far the BEST! We make them all the time!!! Great muffin recipe...my whole family enjoyed this. Will definitely make these again. Finally!! I have found a great Choc. Chip Banana Muffin recipe.. just made this recipe and the muffins came out exactly what I have been trying to do with other recipes.. they taste amazing.. I did substitute the melted butter for the same amount unsweetened organic apple sauce..and I used vanilla almond milk..instead of milk, and the muffins came out just like from a coffee shop.. sometimes it takes a few tried and tested recipes, but I have found the best one that I will use over and over.. and will have to try more of your muffins recipes for sure.. Thanks!! May l ask whether there is a typo? According to your tips on making muffins, the amount of double action baking powder for two cups of flour is 2 1/2 t. This could be the case of over leavening as my muffins rose magnificently while baking, then flopped to a much lower level after. I even took the extra step of slowly cooling them in the oven to prevent shrinkage, and yet it happened. Please advise. Thanks.